As Doc Cottle works to save Commander Adama's life, Col. Tigh is beginning to realize that there's more to being a leader than giving orders. The press is clamoring for answers, everyone wants a decision now, and he feels himself being drawn to his old friend and enemy, the bottle. Worst of all, the Quorum of Twelve has arrived on the Galactica and is demanding to see President Roslin. Tigh resists, but his wife Ellen convinces him that the president has lost her mind and that letting her meet with the Quorum will only cement Tigh's power. The plan backfires: Roslin's odd behavior was only a symptom of chamalla withdrawal, and when she meets the other leaders she has recovered her composure. She condemns Adama's action and announces that she is the leader, spoken of in the Scrolls of Phylia, who will lead the people to Earth. Livid, Tigh orders the Quorum off his ship. Meanwhile, Lee Adama leads a search-and-rescue mission to find the Raptor crew lost on Kobol, unaware that the Cylons have set up a missile battery in anticipation of such an effort. It falls to the beleaguered survivors on the ground to knock out the Cylon artillery before Galactica's rescue team flies into the trap. Unfortunately, Chief Tyrol has serious misgivings about Crashdown's plan to destroy the missile battery and about the lieutenant's ability to lead a team of non-combat personnel against high-tech killing machines. - The title of this episode, Fragged, is military slang that refers to friendly fire on a superior officer in a unit that lacks discipline. - This is the first episode in which Starbuck makes no appearance. - This is the first episode in which Helo makes no appearance. - This is the first episode in which there are no scenes on Caprica. - Boomer also makes no appearance in this episode. - Six says that because Socinus, Tarn, and Crashdown died on Kobol, they are denied entry into the afterlife. - Survivors, according to the main title: 47862. - Cally only joined the military to pay for dental school. - This episode establishes that the Gemenese are a the most religious of the twelve colonies, to the point of fundamentalism. They interpret the sacred scrolls literally. - Six says that god turned his back on Kobol, man, and the false gods he worshiped and that what happens on Kobol is not his will. - Tigh's "why aren't you in the brig?!" lines. - Tigh: "The press?" Gaeta: "They demand to know how much longer we plan on holding them and when they can contact their home ships." Tigh: "They demand? They're in no position to demand anything. You tell them to shut their yaps. We'll get to them in due time." Dee: "Excuse me Colonel. Shuttle from the Zephyr just requested permission to enter the landing pattern." Tigh: "The Zephyr?" Dee: "Yes sir, evidently the Quorum of Twelve is aboard. They're demanding to see you." Tigh: "They demand?" Apollo: "Demanding job commanding a battlestar." - Tyrol: "Basic ground assault was a long time ago for all of us. Those aren't training officers out there, they're programmed killing machines." Crashdown: "We don't have any choice, Galactica will definitely be sending a search and rescue party, it's just a matter of time and if we don't take out that launcher--" Tyrol: "We can't go up against an armed and defended position like that. They'll wipe us out in the first two minutes." Crashdown: "That's enough! Chief, look, under the circumstances, it's important that you keep your cool." Tyrol: "I don't believe I've lost my cool." Crashdown: "I disagree! Look, I don't wanna attack the launcher either but it's our duty. We owe it to the rescue party and we owe it to Socinus and Tarn." Tyrol: "I fail to see what this has to do with Socinus and Tarn." Crashdown: "Well maybe that's why I'm an officer and you're not. Dismissed." - Six informing Baltar that one of the members of his unit will turn against the others. - Crashdown pulling his sidearm on Cally. - The Cylons hearing the gunfire and attacking. - Tyrol taking out the DRADIS dish. - Apollo blowing up the Cylon Centurions with missiles from his raptor. - The Quorum of Twelve visiting Roslin and Roslin revealing her religious plan to them as well as her terminal breast cancer. - Apollo: "How did Crashdown die?" Baltar: "Leading the charge. He gave his life in the finest tradition of the service." Tyrol: "Yeah. He was a hero to the end." - Tigh declaring martial law. - Tigh to a marine regarding the press: "Get those people the hell off my ship." I think there's a lot of significance in this line. By now referring to the Galactica as his ship, we're starting to see a profound change in attitude in Tigh. This is another wonderfully multifaceted episode both on Kobol and on Galactica. Now that all the major crises on Galactica have been dealt with, the civilian population is going nuts over the deposition of the president. I love the wonderful twist in which Ellen Tigh visits Roslin and comes to believe that she's gone completely crazy, so she convinces Tigh to let the Quorum of Twelve see the president when they ask to. But by the time they get around to seeing her, Billy has convinced the guard holding Roslin in the brig to procure some chamalla extract for her, rendering her no longer crazy. Roslin very clearly outlines her plan to the Quorum; Ellen Tigh's plan to discredit the president which would leave Tigh in unchallenged command of the fleet effectively fails. This pisses off Tigh, however, who believes that he must maintain control over the fleet and not allow Roslin to pursue her crazy religious plan, so he does the unthinkable and declares martial law. And to top it all off, he's drinking again. I can't imagine that this is leading to anything good. In addition to having time to deal with the civilians, Galactica had time to send a search and rescue party to recover those who crashed down on Kobol. As hinted at previously, Crashdown's leadership is sketchy at best. He may be a good pilot, but he has no experience commanding a ground unit. So it's no surprise that his plan to attack the Cylons to prevent them from destroying the search and rescue raptors ends up being a colossal failure. I loved how he gradually lost his cool throughout the episode culminating to the point when he pulls a weapon of Cally for her cowardice. I also love how Baltar is the one who saves her life. Finally, there's something of a bitter irony to a character named Crashdown crashing down onto a planet and dying there shortly thereafter. The Cylon Centurions themselves make another set of marvelous appearances as well. Hot off the heels of Valley of Darkness, the Cylon Centurions are depicted as very frightening and very real enemies despite the fact that they're done entirely by visual effects. There's something very different about this show's Cylon Centurions when compared to something else very visual effects heavy like the Star Wars prequels. The Star Wars prequels are virtually all spectacle, yet they don't look at all as realistic as this. 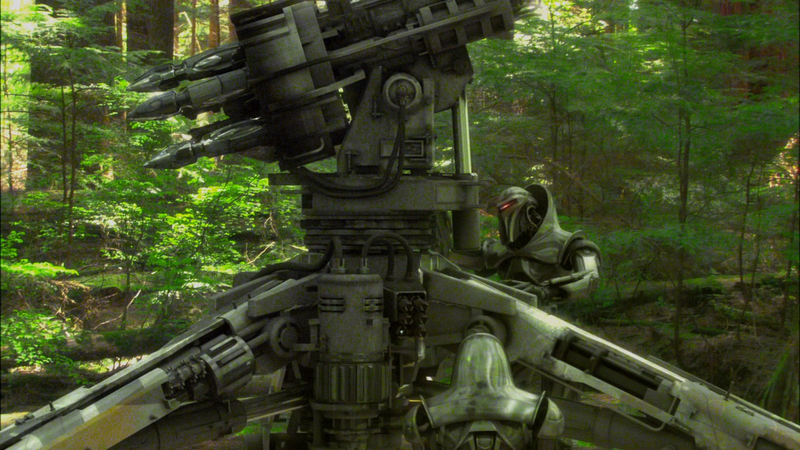 I think that says a lot about BSG's visual effects artists and their skill. The biggest weakness of the story is the issue of why the Cylons didn't send another basestar to Kobol. If they had, such as perhaps the one(s) that attacked Galactica in the prior episode, it would have likely prevented their military defeat in this episode. In particular it certainly would have made it so the Centurions didn't need to dismantle their ship. There are any number of reasons why the Cylons may not have been able to get a basestar there in time, but I would have preferred such a reason having been made explicit. Overall though, Fragged is another very successful action piece with some fantastic character moments.